B.K.S. Iyengar was born on December 14, 1918. He started doing yoga as a teenager in an effort to improve his health after contracting tuberculosis, studying with his brother-in-law, Krishnamacharya, in Mysore, India. Iyengar began teaching yoga in 1936. As American and European students began seeking yoga instruction in the 1960s, Iyengar's method rose to prominence. He established his principal school, the Ramamani Iyengar Memorial Yoga Institute (named for his wife) in Pune, India in 1975. This center became a nexus for the popularization of yoga. 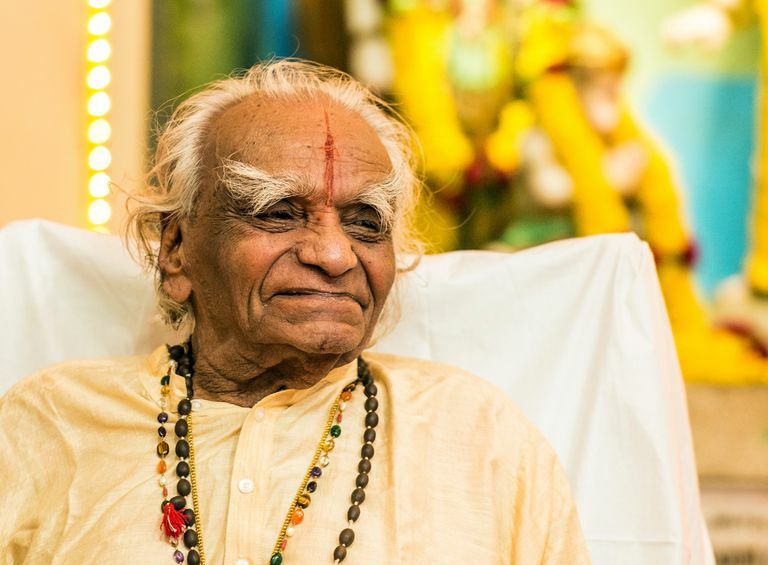 As one of the first teachers to teach yoga to westerners, Iyengar's influence on modern asana practice cannot be overstated. He died on August 20, 2014, at the age of 95. His son Prashant and daughter Geeta now administer the RIMYI. Iyengar's method, a form of hatha yoga, is based on giving primacy to the physical alignment of the body in the poses. In this style, it is taught that there is a correct way to do each pose and that every student will one day be able to attain perfect poses through consistent practice. Iyengar believed that once balance is achieved in a student's body, it will soon be reflected in his or her mind. One of Iyengar's major innovations was the use of props. Today, it is quite common to see blankets, blocks, straps, pillows, chairs and bolsters being used in yoga studios. The use of these props is comparatively new in the history of yoga and comes directly from Iyengar. The purpose of the props is to allow students to have the best possible alignment while their bodies are opening up. As an example, let's look at triangle pose. In this pose, your hand ideally comes to the floor on the outside of your front foot. But what if it is difficult or impossible for you to bring your hand to the floor without compromising the opening of your chest, which is one of the main purposes of the pose? In Iyengar's view, the alignment of the left shoulder over the right should be facilitated by the use of a block under the right hand until the body becomes open enough so that the block is no longer needed. This is one of the ways in which Iyengar's method makes yoga more accessible to a wide range of people. The props are used the adapt the body to the correct alignment, and can be used according to the student's own needs. Vinyasa flow is a term used in yoga to describe the fluid transition from one pose to the next in conjunction with either an inhale or exhale of breath. Iyengar-style yoga includes very little vinyasa flow. Instead, poses are held for longer durations while the alignment is perfected. Therefore, Iyengar yoga is not as intense a cardiovascular experience as a more flowing style such as Ashtanga. Holding the poses, however, is strenuous, builds strength, and is excellent for increasing flexibility. The absence of vinyasa flow is another reason why the Iyengar method brings yoga within reach of a broad population. It's a great place to start for people who are not physically able to do a flowing style practice. This makes Iyengar one of the most popular styles of yoga worldwide. In addition to developing and popularizing his style of practice, Iyengar's books are highly respected and have become classic yoga texts. Chief among them is Light on Yoga, first published in 1966, which describes and illustrates hundreds of yoga poses and many breathing techniques. His other important books include Light on Pranayama, which focuses on breath work, and Light on The Yoga Sutras of Patanjali, which is a translation and interpretation of the ancient Yoga Sutras, from which Iyengar drew the philosophical groundwork for his method of yoga. His last book, Light on Life, addresses the mental and spiritual aspects of yoga. Don't get the idea that an Iyengar class will be easy, even though the style of practice is adaptable to different levels. Iyengar is also very appealing to more advanced yogis who want to work on their alignment. People who are very meticulous, technical, have an interest in anatomy, and an appreciation of subtle movements in the body typically enjoy Iyengar-style practice. Even if you never take an Iyengar class, his influence is so prevalent today you will surely encounter it in the way poses are taught and props are used across the yoga spectrum.